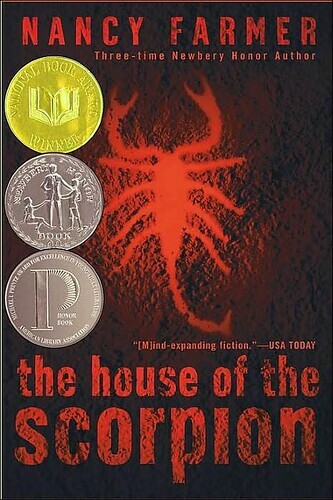 You can’t see me, but I’m applauding, having just finished Nancy Farmer’s masterful sci-fi novel, The House of the Scorpion, which tells the story of young Mateo Alacran, the clone of the world’s most powerful drug lord and dictator. In the future where the novel is set, clones are considered foul, disgusting creatures, no better than livestock, and Mateo has a difficult time growing up among this evil and twisted family of aristocrats. Actually it’s unfair to call these people aristocrats. They’re simply members of a murdering drug cartel, one that relies upon slaves with implants in their brains that force them to be obedient. Mateo’s only initial friends are his bodyguard Tam Lin and the servant woman responsible for raising him. More friends come along as he ages, but life is never peachy for Mateo, who has inherited the original Mateo’s physical features, but not his desire to destroy or own everything around him. El Patron, or The Godfather, is everything Mateo is not. And yet the boy can’t help but love the evil old man whose DNA he holds. It’s an interesting commentary on the old nature vs. nurture argument, though whether this was the author’s intent I can’t say. It doesn’t feel like an editorial though. This isn’t a sermon. It’s a story. And an amazing one at that. The book reminded me somewhat of a Dickens novel in that there was this young innocent boy battling for survival among some of the most vile and wretched people imaginable. But I guess that’s why I kept reading. Mateo’s struggles are real and painful. You can sense his isolation and feel his confusion as he struggles with his own identity. And certain death was always just a page away. I was hooked. Farmer has an uncanny ability to mix cultures and characters in a way that is both captivating and realistic. This is world-creation at it’s best — the sounds, the smells, and the sights of a country whose only crop is opium and whose only purpose is to satisfy the insatiable greed of a self-serving despot. A wonderful read. Heartfelt and well worth your time. Five enthusiastic stars.